Michelle Dovey has prepared a new range of paintings for her exhibition at Gimpel Fils. Dovey's work is anchored in a study of nature and especially of trees and their branch structure. The work evokes a reference to historical landscape painting, originally with George Stubbs as a key point. Michelle Dovey has studied the use of light in the work of the Dutch Italianate artists, partly influenced by the warmer tones of light depicted in their work evoking Italian light. In recent years, Dovey has shifted between paintings of individual trees and images of woodland, always using colour to reproduce the organic matter that is conjured up by a brilliantly chromatic rendition of wood, woods and trees. Because light is so important to her, Dovey frequently painted observations of dawn on the areas surrounding her home. The exhibited work, grouped under the title 'Colourful Sausage Trees', show Michelle Dovey at her freest. She has chosen to focus on a single oak, then paint it in various hues and shapes. 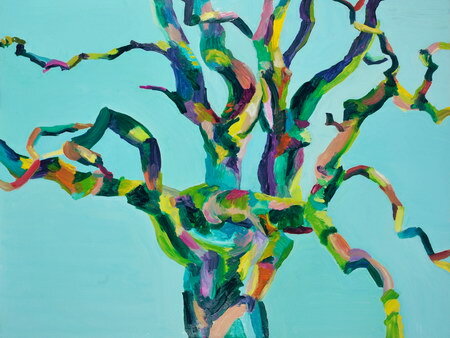 Dovey's stated aim is not so much to reproduce a tree, this tree, as to use it as a means to conjure up a kaleidoscope of colours, contrasts and juxtapositions of colour, rhythmic repetition and the layered intensity of overlapping paint strokes. Against a mono-colour background, branches dissolve into a riot of colour, pulsing in short bursts and occasionally colliding in a fusion of movement. Dovey states that she starts out with an intuitive feel for the developing work, rather than aiming for a particular finished image but, as the painting progresses, the image becomes more intentional and defined. "For the Colourful Tree series, I worked plein air in our garden studying the same oak tree. When I gave myself permission to paint this tree in any colour or new way that I wanted to, I started a dialogue with myself that informed each mark and colour. A very simple question 'how would you like to paint that bit?' and then waiting for the answer. It was very specific when it came. So the trees became a vehicle and not only the subject. One of the new themes I recognise is that the tree form is a vehicle for rhythm. That pulsing rhythm,going in and going out, as in looking in and looking out, is one of the subjects."